Baseboard heaters operate via convection. Cold room air enters the top vent, and heated air is expelled from the lower vent. In forced hot-water baseboard heaters, hot water in the baseboard unit heats the incoming air. Naturally, hot-water baseboard heaters can become quite hot. For safety's sake, you shouldn't have anything within 12 inches of a unit. As fabric can be a fire hazard, you must keep your curtains away from a baseboard heater. Forced hot-water baseboard heaters can become quite hot. Put the end of your tape measure against the top of the baseboard heater, and measure 12 inches up the wall. Mark the 1-foot point with a pencil. Measure the distance from the top of the window well to the place on the wall you marked with your pencil. If you are hanging your curtains from the ceiling, measure the distance from the ceiling to that 12-inch mark. Buy or find curtains that do not drape below the 12-inches-above-baseboard mark. If you cannot find curtains that are short enough, hem the curtains by hand or with a sewing machine. Alternatively, if you think you won't like the look of curtains that end a foot off the floor, consider getting curtains that end at the windowsill instead. Slide the curtains onto you curtain rod, and install the rod into the brackets at the top of your window -- or at the ceiling, if the brackets are there. 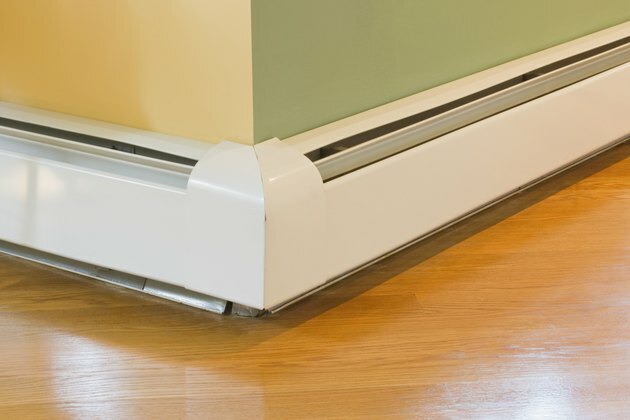 How Far Away Should Curtains Be From Baseboard Heaters?